After the sightseeing in and around Anchorage on day 1, we drove to Denali National Park and preserve the next morning. The drive was very pretty and scenic. There were low lying clouds , mist and rain on the hills along the road. It was a little gloomy if you were alone, but we were about 5 of us so it was a lot of fun. 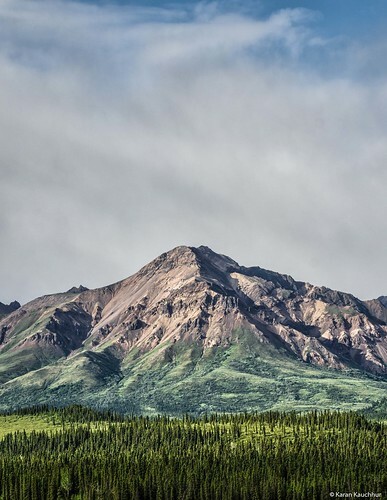 The problem with Alaska is that you don’t get cellphone signals and even GPS doesn’t work once you are out of the main city area, so if you are planning a trip make sure you do your homework on the route before you leave. Denali NP is centered around mt. 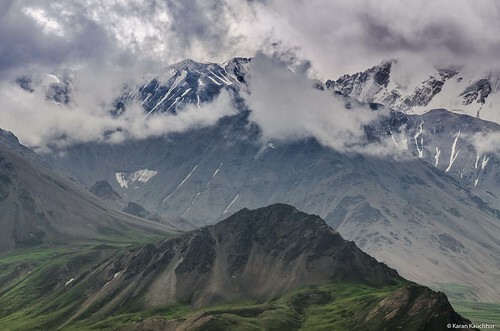 McKinley which is the highest mountain in North America. 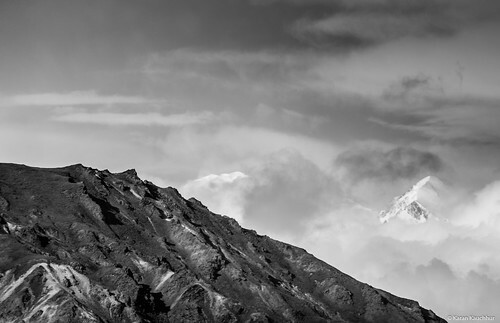 Its originally called Denali , which means “The High One”. As a tourist you need special permit to drive your personal vehicle inside the park. You can only go up to the first 15 miles after which for the next 91 you have to use the Park’s services. The image above is of the Savage River Trail head. You can park your vehicles here and do this trail or hop on to the Park’s bus service and go further into the park. The reason why the park bus is used is because the wildlife there has gotten used to these buses. The animals treat them like any other rock, tree or object and are not intimidated by it. This is because these buses have always been there, ever since that particular animal was born, so they have sorta become part of their environment. These animals recognize these buses but not the humans sitting inside it, so be careful, don’t jump out and be quiet. 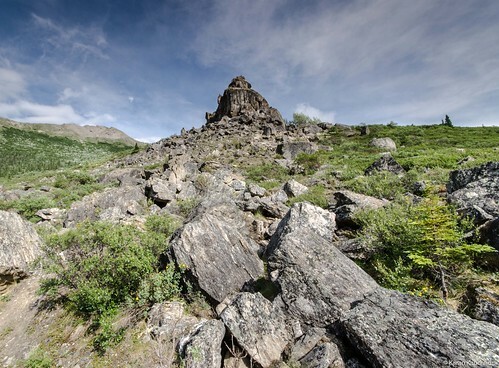 The bus allows you to get off at certain scenic locations to get the view of the Park and the Tundra. The above image was shot from one of those viewing areas. 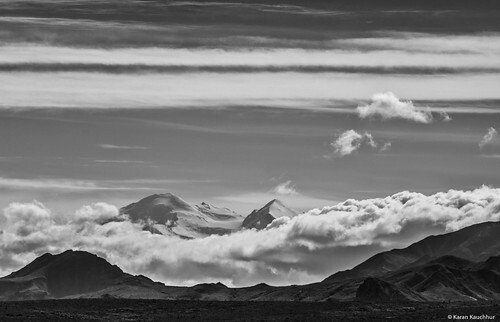 You can see the hills with low clouds entirely covering the Alaska Range and the Tundra. if you are lucky and the weather is clear you can also see Mt. McKinley from the moving bus. We weren’t so lucky because the clouds were too low, but we did see a glimpse of the North Tip. The first image was shot on our way in and the other on our way back. When in the bus you also get to see a lot of wildlife if you are lucky. The bus driver stops for you and you can take as many photos as you like as long as your are quiet and stay inside the vehicle. 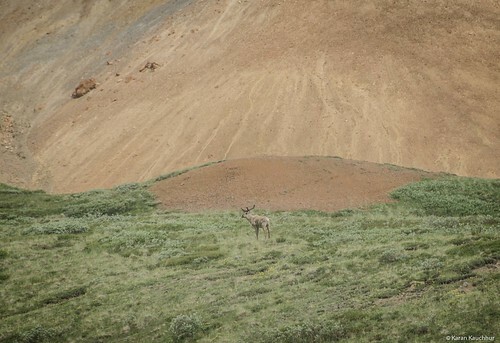 We say plenty of Caribou, Moose and Doll Sheeps in the way. infact we even say a grey Wolf at the beginning at Savage river entry point. The image below shows how low and dense the clouds were. This image was shot at another of the scenic/break areas on the way. Finally we reached mile 66 which is the Eielson Visitor Center. There is a small ranger led hike , where the Ranger basically explains the climate, the soil, the permafrost, wildlife etc etc. 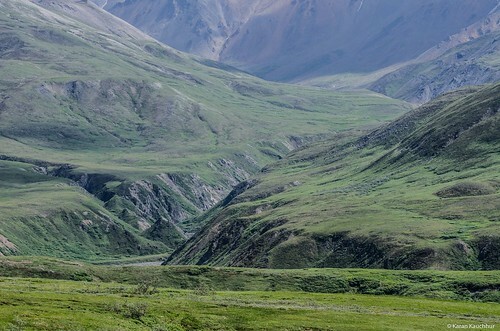 I would recommend this trail because then you will really appreciate what the Denali NP is all about. And the best part is that its free. Its also a beautiful viewing area as you can see from the images below. 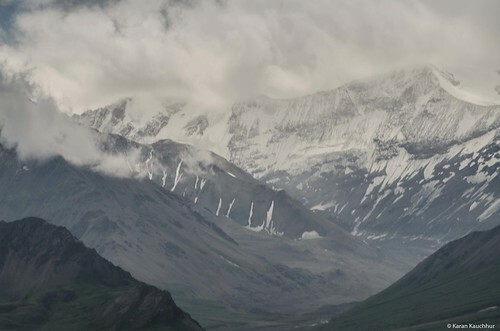 These images are of the Tundra, and the Alaska Range. 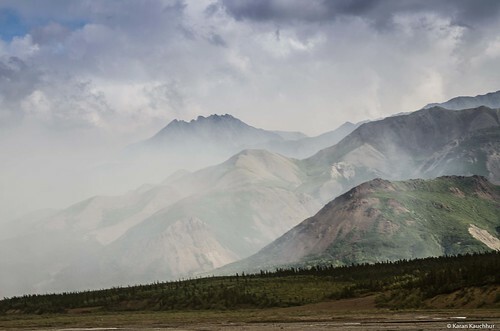 We stayed about 3 nights in Denali. There were a lot of activities we did like cycling in the park, rafting, hiking etc. After that we were on a our final leg to Kenai peninsula to catch a cruise to see the Glaciers. Awesome pics Karan. How did you plan the trip? Did you use a guided trip or just used guide books? Lovely black and white conversions. Thanks Sugoto. We basically did research on Google. Read the NPS page (http://www.nps.gov/dena/planyourvisit/shuttles.htm) and in general read blogs and an info that was out there.